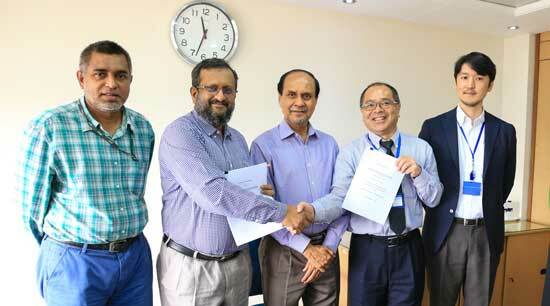 Palli Karma-Sahayak Foundation (PKSF) has signed Record of Discussions (R/D) with Japan International Cooperation Agency (JICA) for “The Project for Developing Inclusive Risk Mitigation Program for Sustainable Poverty Reduction” in Bangladesh on September 26, 2018. The main objective of the project is to provide financial & non-financial services to the poor households of Bangladesh to mitigate financial risk and increase resilience against irregular behavior in climatic environment including natural and personal disasters. Mr. Yasuhiro Kawazoe, Senior Representative of JICA Bangladesh Office and Mr. Md. Fazlul Kader, Deputy Managing Director, PKSF signed the R/D on behalf of their respective organizations. Mr. Md. Abdul Karim, Managing Director, PKSF was present on the ceremony. Mr. Keisuke Sawada, Project Formulation Advisor, JICA Bangladesh Office, Ms. Syeda Sadia Hasan, Deputy Program Manager from JICA and Mr. Md. Hasan Khaled, General Manager and other officials of PKSF were also present during the signing of the R/D.